Love eating delicious healthy foods? I wonder who don't... LOL! My seven years old son always think that healthy foods like salad, carrots and celery are not delicious and delicious foods like pizza, ice cream, burgers and fish and chips are not healthy. Well, would you trust a seven-year-old kid for his analogy? To some extent, I can't deny that he does make some sense but I would prefer to educate him towards the more positive way of perceiving delicious food. "Whole foods are delicious foods. Eating a healthy diet based on whole foods doesn't mean depriving yourself, counting calories or restricting enjoyment. It means eating well and loving it." - Chrissy Freer, author of the book, Real Delicious. What is whole food? Whole foods are foods that are unprocessed and unrefined, or processed and refined as little as possible, before being consumed. For example, brown rice is a whole food and white rice rice is a processed food. In this case, we should eat more brown rice than white rice because the brown grain retains its nutrient-rich bran and germ. 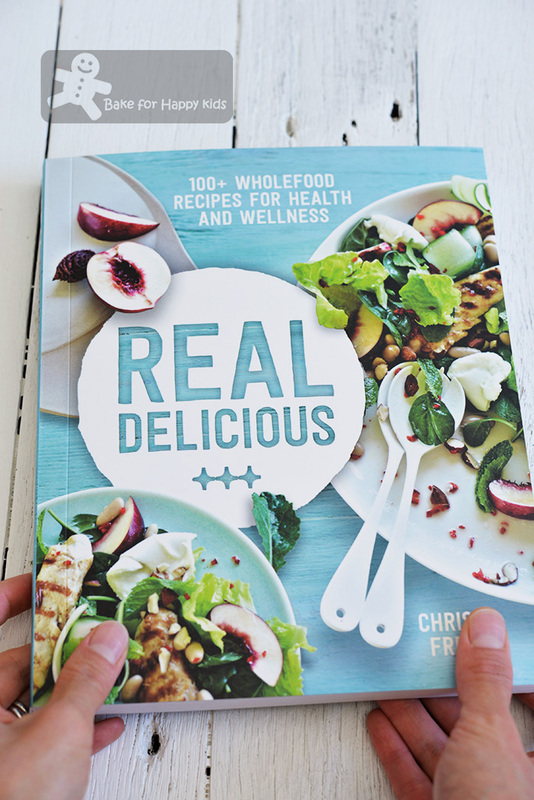 I kind of like Chrissy Freer's way of defining and creating delicious healthy foods. What she said is not referring to any fad diets or obscure food philosophy. Just simply eat food with the least amount of processing and then you and I can be healthy! She totally make sense to me! Lucky me that I'm now a happy owner of this book because this book is totally positively knowledgeably nutritionally awesome!!! Do you want to know more? First, please allow me to show you how I baked these easy and healthy seed and nut bars using one of the recipes in this book. 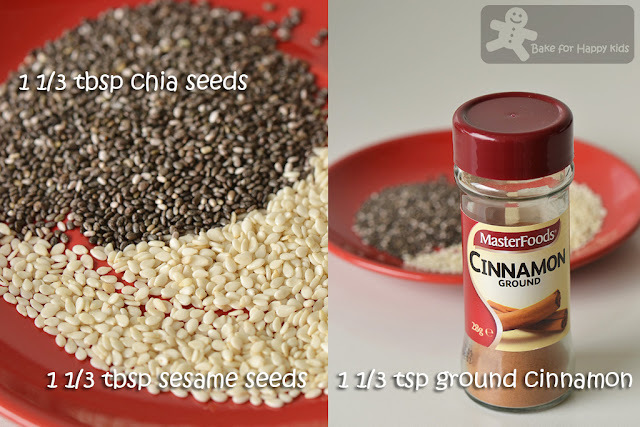 You can use any nuts (including walnuts) and seeds that you like. 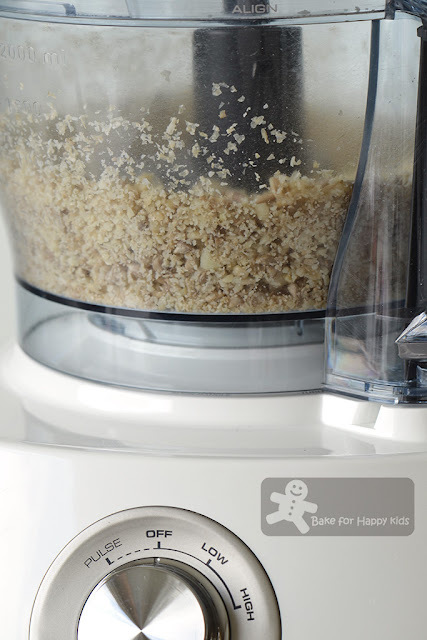 Roughly chop the nuts in a food processor. Then, get ready these ingredients. 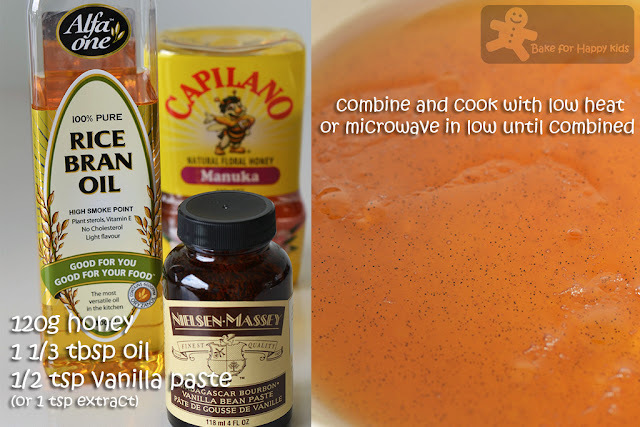 Notice that the amount of oil in this recipe is so little!!! 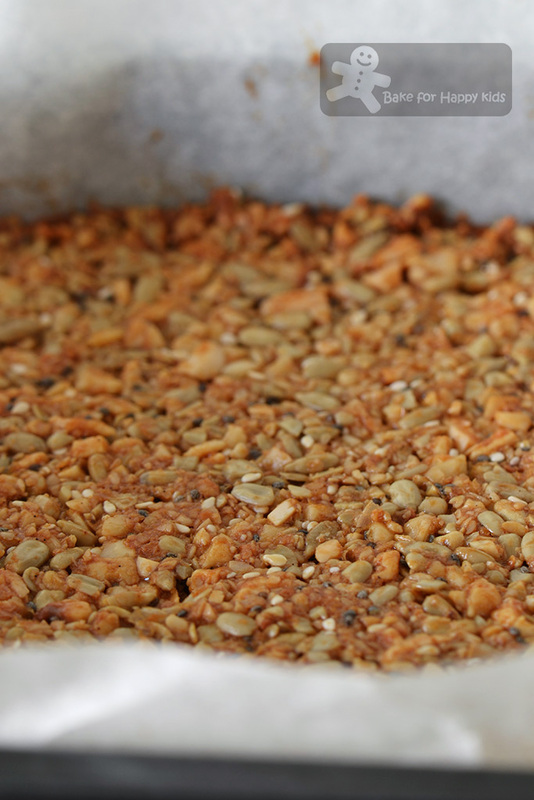 Then do this and the mixture is now ready to bake. 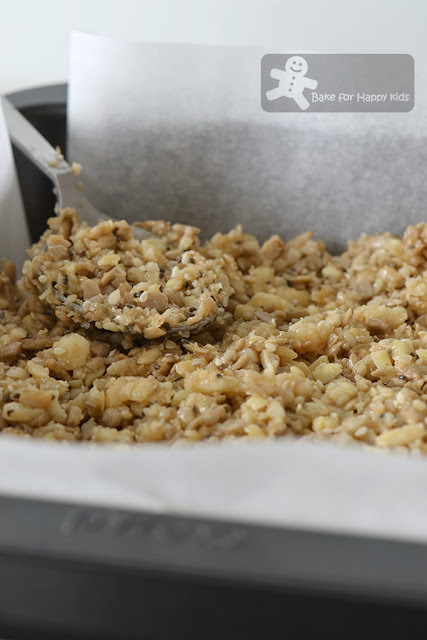 Transfer nut mixture into a baking pan lined with baking paper. 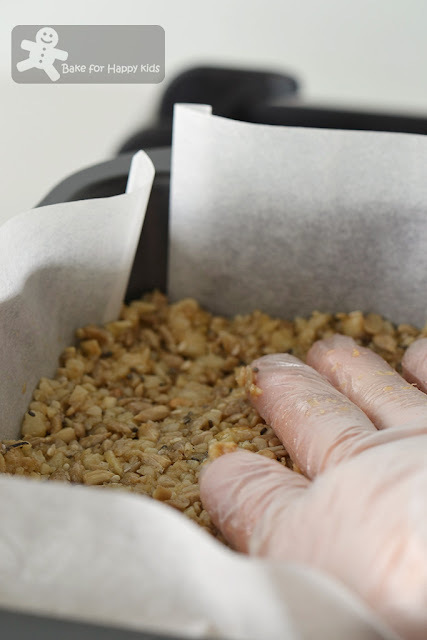 Use either the back of a spoon or your hand (with food processing glove) to press mixture firmly onto the tray. Please make sure that this step is done properly or else your bars will be loosely bound. Bake in a preheated oven at 150°C for 20-30 mins or until deep golden brown. Wow! Baking these makes the kitchen smell SO GOOD!!! The original recipe says that the bars need to be refrigerated until chilled but I reckon that I didn't have to do this step. Cut into bars or squares and serve! 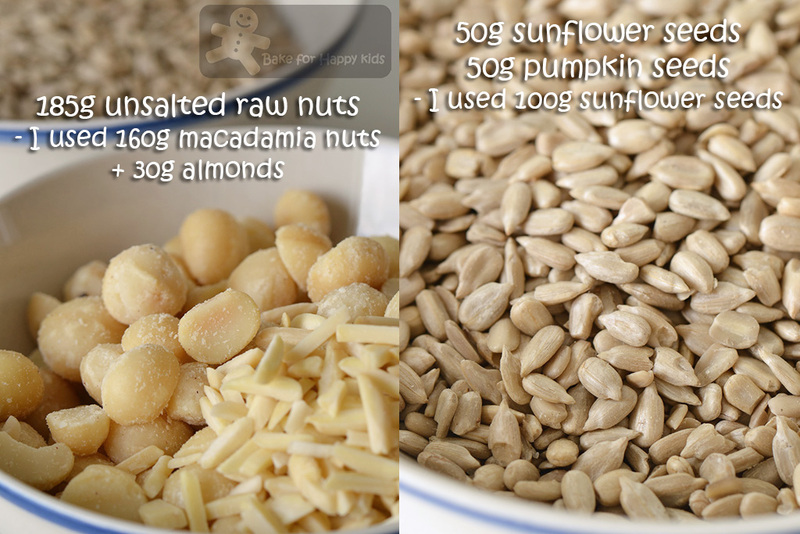 This is the picture of the seed and nut bars shown in this well-illustrated book. With no added white sugar and any processed or artificial ingredients, these bars are fully packed with real whole food and heaps of goodness. Best of all, they are yummy too! 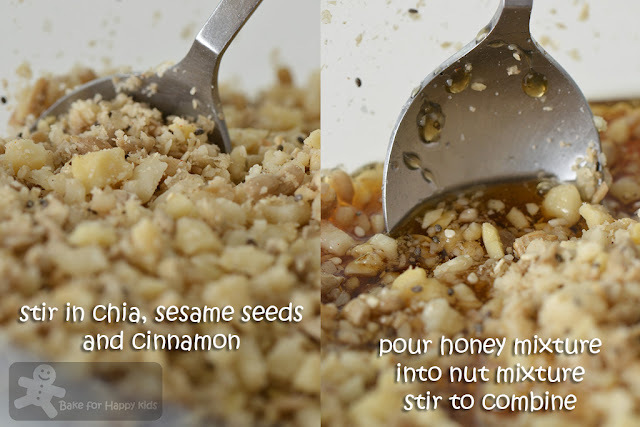 For a vegan variation, you can replace honey with rice malt syrup. Store these bars in an airtight container and keep them up to 2 days at room temperature and up to 2 weeks in the fridge. Now, can you see why I said that this book is totally positively knowledgeably nutritionally awesome? 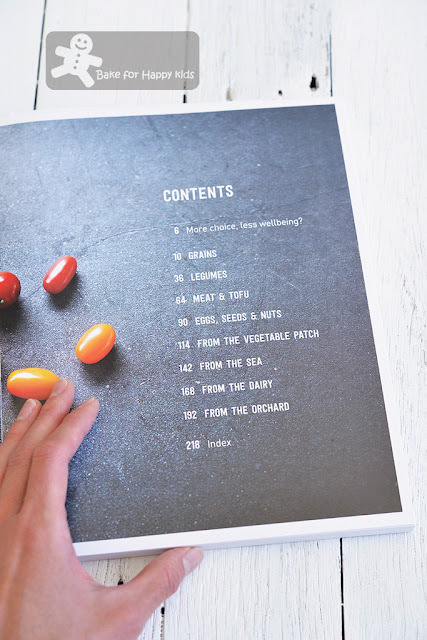 Positive because this book encourages positive thinking about food. We must enjoy eating our food and it teaches me how to choose the right food to eat. Best of all... no counting calories here! 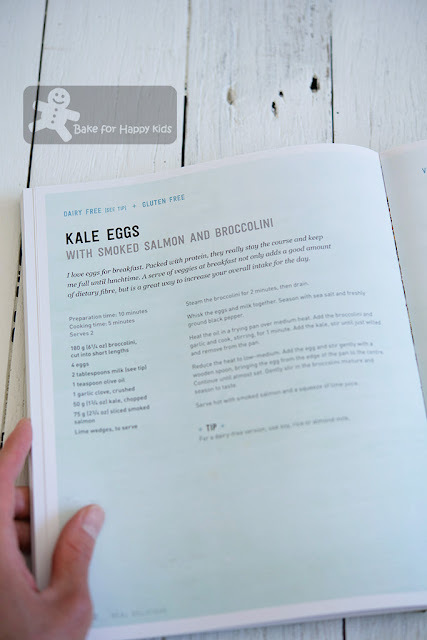 Knowledge because it is a well organised book classifying whole food according to their species, sources and nutritional purposes. 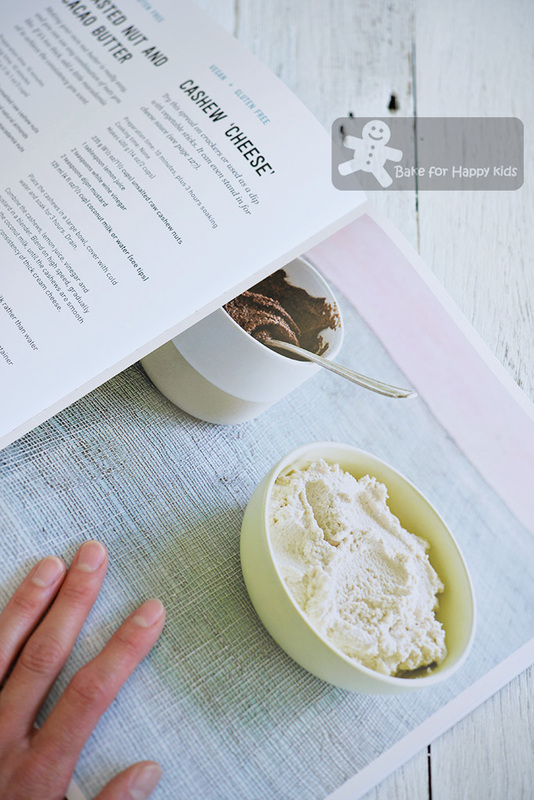 Every chapter of these classified food contains many food facts and I'm sure that Chrissy being well-qualified nutritionist can deliver the most accurate food information. The recipes and information of this book are well classified according to these chapters. Free-range, oragnic, certified organic? What does it all mean? How fresh is fresh eggs? Canned fish - a good option? Are dried fruit good for me? Do you know the correct answers to these questions? Thanks to this book, I have gained these valuable knowledge as I'm learning to choose my daily food wiser. Smoked salmon is my son's fav! And I can see that this is a great way to encourage him to enjoy kale too. This cashew cheese is a great option especially if you can't eat cheese because you are vegan or dairy intolerant. This pick-me-up beetroot soup with spiced yogurt is telling me that I need to cook this comforting soup for our coming winter. Ok! 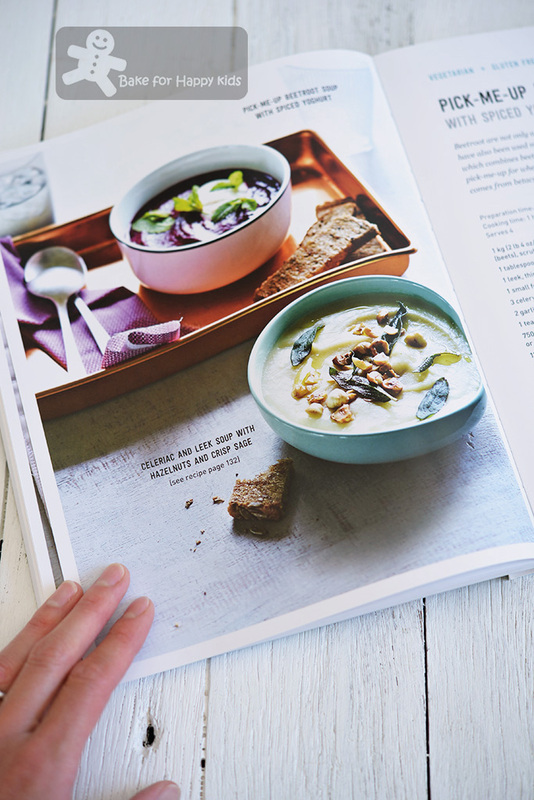 There are more than 100 healthy recipes that you can find in this book... All simple to follow and made with down-to-earth ingredients! Want to see more? Sure! I will show you a few more examples in my subsequent post. If you can't wait and grab a copy of this book now, you may wish to know that it is available in most retail or online book shops selling at the retail price of AUD$35. 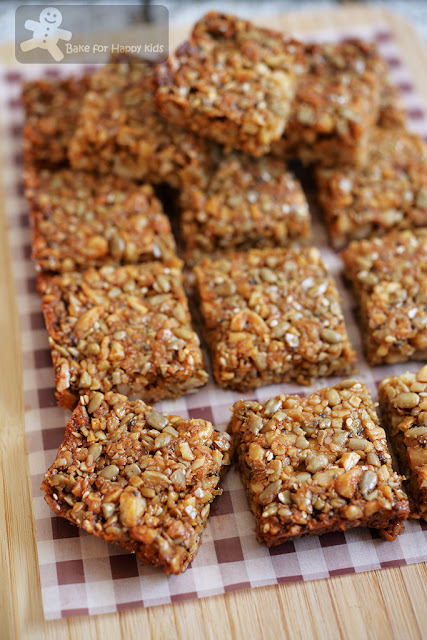 Zoe, I really like these seed and nut bars! Who says healthy can't be delicious, right? 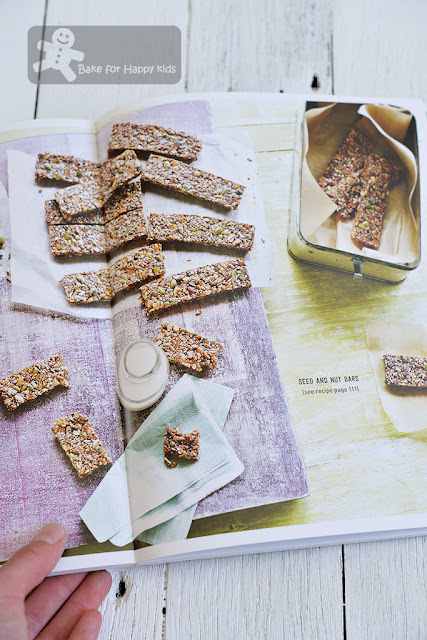 low sugar high protein bar, i wanna try this recipe! Hi Zoe, this looks absolutely delicious! It sounds healthy too. I will definitely give it a try soon. Also, I would like to thank you for organizing the Little Thumbs Up event for so long. It has provided me with many chances to improve myself, be it in cooking, taking photos or writing posts. Thank you! Wishing you and your family a great day ahead. Yes, I'm with you to make and munch healthy snacks. 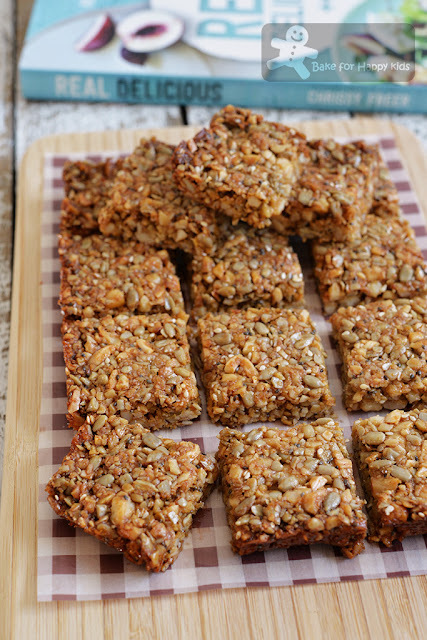 These squarish Seed and Nut Bars are packed with goodness! Zoe, you are so thorough with all your cooking and baking, and provide so much helpful information along with the fabulous photos...I am so impressed, besides all the amazing things you make which is so healthy and super delicious! 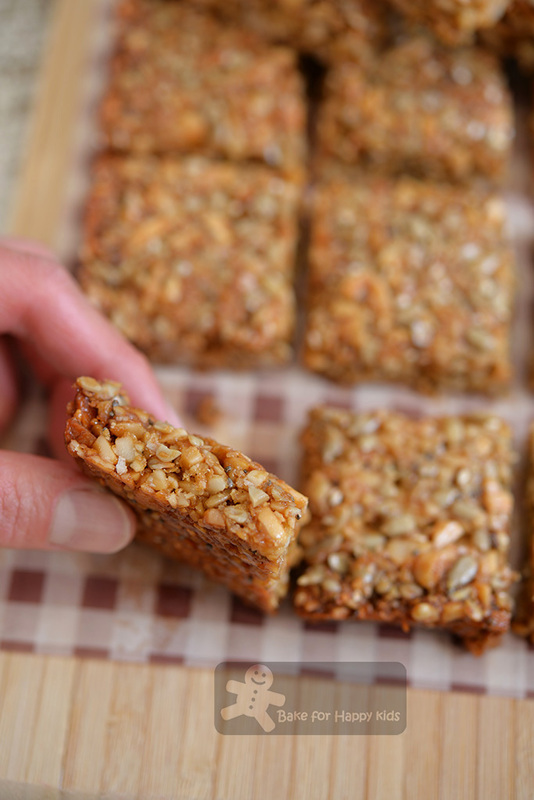 Love these yummy bars, and such a great snack for kids, especially! I Google+'d it to share! Zoe! Good recipe. This is definitely for me! Zoe, thank you for sharing this healthy snack. Look forward to more healthy recipes from you. Hi Zoe, do you know the book is selling at any bookstores? You should be able to buy this book at major online bookstores like Book Depository and Amazon.